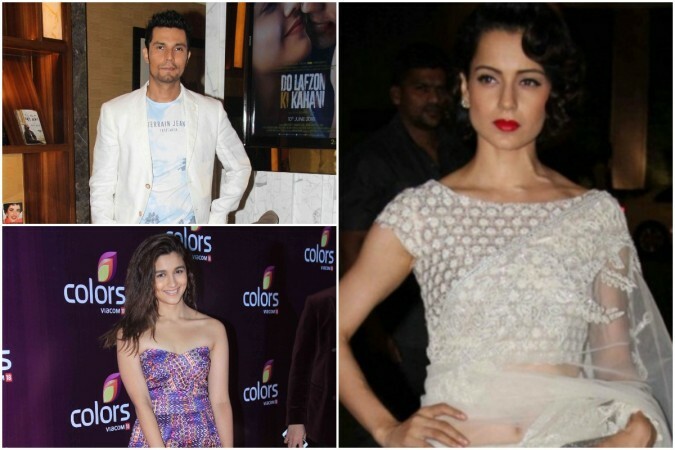 Randeep Hooda took to Twitter and made a tweet that appears to be a jibe at Kangana Ranaut for targeting Alia Bhatt lately. 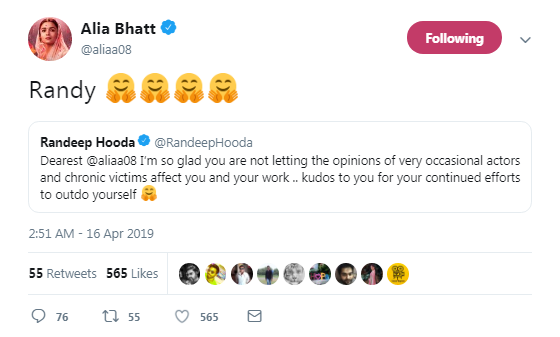 At a time when Kangana Ranaut has been making unpleasant remarks on Alia Bhatt, Randeep Hooda made a tweet supporting the latter in this cat-fight. Randeep took to Twitter and made a tweet that appears to be a jibe at Kangana for targeting Alia lately. Randeep in the tweet congratulated the Raazi actress, and also slammed an "occasional actor" for making opinions on Alia. "Dearest @aliaa08 I'm so glad you are not letting the opinions of very occasional actors and chronic victims affect you and your work .. kudos to you for your continued efforts to outdo yourself [sic]," he tweeted. Although Randeep did not directly mention anyone's name as "occasional actors" or "chronic victims", his tweet certainly hints at Kangana as it is the Queen actress who has been making insulting comments on Alia. She replied to his tweet with smiling emojis. Randeep and Alia had worked together in the critically acclaimed film Highway. Soon, it escalated to a dirty level as Kangana's sister Rangoli Chandel replied to Randeep's tweet, accusing him of harassing Kangana during a film shooting, and even called him "permanent failure". "Alia baby ko bachane ko nepotism gang ki khud ki himmat nahin toh tujhko aage kiya, I know during film Ungli what u did, kitna harass kiya tune Kangana ko aur kitna bada chatukar hai tu Karan Johar ka....(contd) @RandeepHooda," Rangoli tweeted. "(Contd).....magar phir bhi tera kuch nahin hua, at least people like Alia are successful because of chamchagiri, bhai tu to permanent failure hai @RandeepHooda," she added. Kangana and Alia's fight started after the actress ridiculed the latter for not speaking on national issues and not supporting her film Manikarnika when it was surrounded by controversies. She had even later referred Alia as Karan Johar's "puppet". Alia had chosen to remain calm, and replied to Kangana's jibe saying that she did not do anything intentionally to hurt the senior actress, and she did not deserve such criticisims. However, the outspoken diva did not end it here, and went on to say that Alia's performance in Gully Boy was "mediocre", and she feels "embarrassed" to be compared with the Raazi actress. Alia yet again, had chosen to stay composed, and responded to it saying that she respects Kangana, and would work hard to impress her someday. Kangana's constant digs at Alia did not go down well with many on social media as well. A lot of people expressed discontent at the national award winning actress making such derogatory remarks on a junior actress, who has been winning so many accolades for her work in recent time.